The Australian summer of tennis is nearing its conclusion as the top two seeds, Serena Williams and Maria Sharapova will battle it out for the 2015 Australian Open title. It’s been a fun two weeks as always, but i’m looking forward to normal sleep patterns and not dreaming about tennis results (is that just me? probably, i’m weird). It’s rare to see the top two women’s seeds in the final and Kevin Fischer from the WTA produced a pretty crazy stat. Maria Sharapova was first into the Australian Open final with a comfortable 6-3 6-2 victory over Ekaterina Makarova. It sounded like a really disappointing and flat match but as with most of this week, i’m going off short highlights and Twitter reaction. The Sharapova-Makarova match-up is not a fun one at all. Makarova hit 11 winners to 29 unforced errors and won less than half of her service points. Sharapova wasn’t great herself, producing seven double faults in windy conditions. It’s not been a particularly challenging route through the draw for Sharapova, but the scare against Alexandra Panova in the second round where she saved two match points has certainly made her more focussed and match-tight. If a player wins a match from such a precarious situation, it often makes them stronger. That has been the case with Sharapova who hasn’t dropped a set since with victories over Zarina Diyas (6-1 6-1), Peng Shuai (6-3 6-0), Eugenie Bouchard (6-3 6-2) and Ekaterina Makarova (6-3 6-2). I was feeling flat about the two women’s semi-finals beforehand, but I am really glad that at least one of them delivered a competitive match. Madison Keys displayed another brave performance, eventually falling to the world number, Serena Williams, 7-6(5) 6-2. She got a hug at the net for her troubles, which was a nice touch from Serena. I was quite concerned that Keys would pull out of this match, but she really gave it a good go. For the record, I think Madison is a future Grand Slam champion and that was my feeling before this tournament (i’m sure I said it somewhere in a previous post!). She will though, have ups and downs, and bomb out of matches that she has no right to lose. It’s going to happen and I just hope people don’t overreact as if she’s moving backwards. Lindsay Davenport has had a great influence already on her game and mentality, and i’m super excited to see what Madison does for the rest of the year. I don’t think she will back this performance up like Eugenie Bouchard did last year going on to reach a Grand Slam final (although Wimbledon will be interesting!) but then again, I don’t think she will slump like Sloane Stephens. This was another slow start from Serena going down an early break, but she fought through in what was a feast of high quality serving. The pair served 25 aces with the difference coming on the second serve; Serena won 68% of second serve points compared to 47% for Keys. 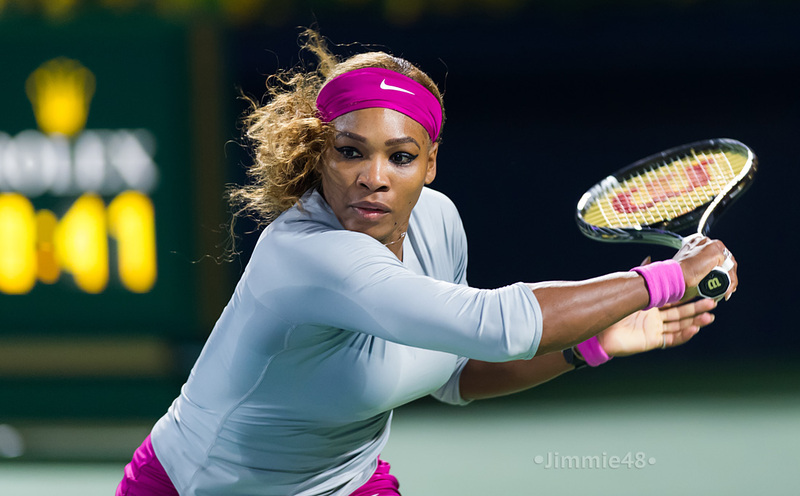 Serena also needed nine match points to finish the match off as Keys refused to budge. It’s been an up and down week for Serena, but she’s made it to the final and through a pretty testing draw. Experience has trumped over youth with Serena defeating Elina Svitolina, Garbine Muguruza and Keys. Her win over Dominika Cibulkova in the quarter-finals was her most complete performance of the fortnight. Serena has been struggling with a cough all week, but it doesn’t seem to have affected her tennis a great deal. So… Serena v Maria. I’m not really sure how I am feeling about this match. I can’t say that I am massively looking forward to the final. Serena leads the head-to-head 16-2 and has won their last 15 matches. Maria’s last win was at the Tour Championships in 2004. Their last four encounters have been decided in straight sets, but the last three have all featured at least one reasonably competitive set. The French Open final in 2013 was an excellent match. Sharapova played very well but Williams upped her level at the ends of both sets. At the start of 2014, Serena won 6-2 7-6(7) in Brisbane, which featured a fantastic second set. Their last match on the WTA tour was in Miami last year where Serena won, 6-4 6-3. Sharapova was up at least one break of serve in the first set before faltering. Serena just owns Maria on a tennis court. After their war of words a few years ago, it’s added a little extra spice to this match-up. Serena has seemed almost invincible and completely in control of what she is doing when she plays Maria. So… chances of an upset? I think because they haven’t played for a quite a while, it will give Sharapova more hope to begin with. Sharapova HAS to start well otherwise it’s curtains. If she gets broken in her first service game, alarm bells will begin to ring immediately because I don’t think Serena will falter on a lead. We’ve also seen one of the long one sided winning streaks snapped this week (Berdych-Nadal) so anything is possible. I’m nowhere near brave enough to suggest Maria can beat Serena, particularly in a Grand Slam final. Serena has shown vulnerability during this fortnight, but once she gets to the final, she’s going to be on it. I pondered between two and three sets but in the end, i’ve gone for straight sets. This week has been hard to watch any tennis so i’ll be absolutely gutted if this is over quickly. For that reason, i’ll be probably be cheering for Sharapova (for the first time EVER) because I want to see a competitive final. January 29, 2015 in Australian Open, Serena, Sharapova, WTA. ← Lucie and Beth into the 2015 Australian Open Women’s Doubles Final! Well…in any other match yes but this is the only match I will wholly watch (apart from the men’s final) so it MUST be a good and competitive one!! what a charmless pair Murray and his girlfriend were, and Murray ‘dobbing’ on Berd to the umpire for mumbling something in passing was so school boy pathetic as to be amazing, he told the teacher on him! The whinging malcontent is great entertainment though. Serena most likely to brush Maria aside as usual. Definitively true, MooMoo. I was talking about Bouchard draws the whole last year. But I have to admit MaSha did not have any really bothering opponent this time. And here we are… The much expected final … S.Williams vs MaSha. That kind of match you can guess the result : an easy victory for Serena is very likely to happen. Of course, that will not be 6/0 6/0 as i told in the previous comment. But i still hope a miracle will happen… if some kind God really exist, please, give MaSha an little help to win. BOB lol ”she doesn’t hit the ball any harder than Giorgi” they were saying on a preview show, Hawkeye measure her ground strokes as the fastest in womens tennis. so stop hating. she’s not overhyped, she’s the future, with Davenport reigning her game back a bit, she’ll win a major in the next 2 years. I think Sharapova has been sloppier than Williams, who has played some world class opponents since that second round and has looked close to her best at least one point in all of her matches. @ Tennis Fan – well said. By the way, if Sharapova does not win the first set, she will usually lose in 2 sets. The stats won’t lie. The only think is her fans are living in their own wonderland hoping miracle will happen. Based on Serena past three matches performance. I think this is a 2 sets match. She had a better year than all the women on tour, winning seven titles. So what are you talking about? Ok if Serena played bad why Sugarpova didn’t step up and claim 11 titles. For your information, Madison hits harder than any players on tour both men and women. You can Google to find out. (The Australian open page said that at last years French open she had the hardest average groundstroke speed (127 kph or 78 mph) which was harder than Djokovic (124 kph or 77 mph), Monfils (122 kph) and Nadal (119 kph). The variation between these two is about Serena’s serve. If Serena’s serve is not working very well on that day, Maria has a shot for the trophy…..pretty nasty! @Sudo ==> Serena’s serve is less efficient those days because the weather was windy. She may be refraining it to avoid double faults. I dunno about the weather prediction for the final, but if there’s no wind, I bet Serena’s serve will improve. So i just have to hope that this final will be windy, and that MaSha will have a better matching to the weather. Marsha has been double faulting like crazy. The match will start at 7:30pm Australian time. The weather is cold at night. It may affect Serena if she is still recovering from her cold. I think this is a three sets match and Sharapova may have a shot this time. Well she lost and never had a shot. She looked sad, but it was a good match. Hope badly miss-placed. Sharapova is a great player; she does hit deeper & harder volleys than Serena. She really impressed me after the LOST with her post game responses: she appeared even getty, cool & comfortable with another hard felt LOSS? She need to stop with the cool, getty attitude; she need to harness the pain from the loss & apply it to her game: study more, practice more, drill until her body burns…Serena has been doing it since 2004.